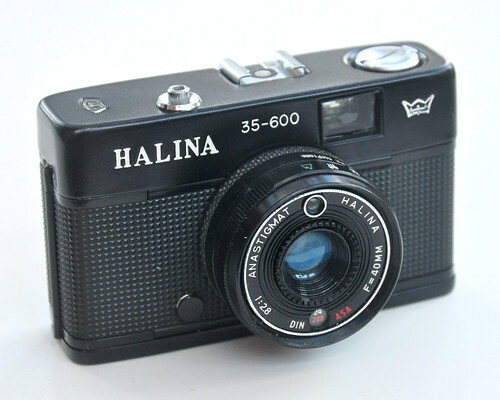 The Halina 35-600 is a compact 35mm viewfinder camera manufactured by Haking. It has many features in common with the better known Olympus Trip 35 but uses a battery operated CdS cell. 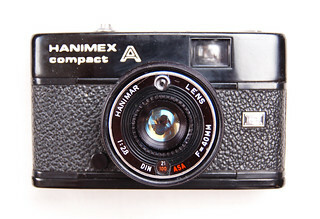 It has a Halina Anastigmat 40mm f/2.8 lens, which can be zone focused using four pictograms of different subjects. Exposure is controlled automatically via a CdS cell within the lens's filter ring in automatic mode (marked A). If light levels are too low in automatic mode a the shutter will not fire and a red flag appears in the viewfinder. It is possible to exposure lock by half depressing the shutter button. As the CdS cell sits within the filter ring, it will adapt to any filter used. The metering system uses a now defunct PX625 mercury cell, although there are modern solutions. Alternatively, the aperture may be set manually (from f/2.8 to f/22) for use with flash. Both a hot shoe and a PC socket are provided. With a battery in place in aperture select mode the setting only determines the widest possible aperture size as the CdS system will still limit aperture opening depending on light levels. Without a battery the aperture will open to the designated size allowing the camera to be used as a fully manual camera. The speed of film is set by a ring around the lens (25-400 ASA in steps). 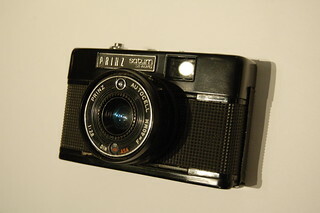 Film is advanced using a thumbwheel on the rear of the camera. The film compartment is opened by latch on side of camera at the base. There is a cable release thread point and standard tripod socket. The Halina 35-600 was sold by Dixons in the UK as the Prinz Saturn 35 Auto. 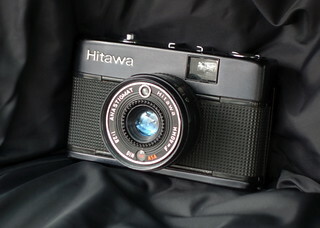 It also appears to have been sold as a Hanimex Compact A, Weist 135L and Hitawa in some markets. The 35-600 was the successor of the Halina 500 (also known as the Cortina 500). This page was last edited on 11 January 2018, at 22:38.